10 acres +/- pasture, tillable, trees, creek, pond, wildlife, 1300 ft. hwy frontage, white vinyl fencing, asphalt drive, gate, nice 20×40 metal building. For sale in online estate auction. Perfect for Recreation, Home Site, Fishing, Camping, Hunting, 4-Wheeling, Livestock, Crops, Gardening, Relaxation & More! Make an Offer Now or Bid Your Price in the Online Auction. Don’t Miss this Investment Opportunity! 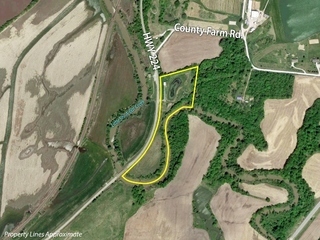 This 10 acre parcel of land features a little bit of everything including pasture, tillable, trees, creek, pond, wildlife, 1300 ft. +/- paved highway frontage, white vinyl fencing, asphalt driveway, gate, nice 20’x40’ metal building w/200 amp electric service, pedestrian door, overhead door with Liftmaster door opener, fluorescent lighting & more! Perfect for recreation, home site, fishing, camping, hunting, 4-wheeling, livestock, crops, gardening, relaxation & more! Make an offer now or bid your price in the online auction. Sale subject to probate court approval. Excel Hustler 402 front mower, Coleman Powermate 5000 generator, Charbroil gas barbeque grill, Propane patio heater and tank, Toro S-120 elec.snowblower, Weedeater string trimmer, Troybilt string trimmer, Coleman lantern, spreader, 4-drawer metal file cabinet, loveseat and chair, folding tables, folding chairs, patio chairs, 36″ pipe wrench, Seldon 1-ton chain hoist, fishing rods/reels, office chairs, dry erase board and easel, folding aluminum ladder, water tank, patio table, picnic table and other misc. US-24 to Highway 131/MO-131, north toward Wellington to MO-224/E Highway 224, then east 1 mile to land on south side. Watch for auction signs.